We have chosen the portfolio-method for assessing the performance of complex exercises. There are three main processes in a maintenance and repair company (the work of a technician) which help to ensure the functional performance of motor vehicles: maintenance, diagnostics and repairs. The connecting link in complex exercises is the knowledge of the purpose, layout, and operating principles of these assemblies and thereby of the motor vehicle as a whole, as well as of technologies used in maintenance, diagnostics and repair. The complexity in exercises is created either horizontally – the teacher has tasks for the maintenance, diagnostics, and repair of an engine – or vertically – the engine, transmission, steering equipment and chassis, electrical equipment and comfort systems, and air conditioning appliances are diagnosed in one exercise (all or some of them). The teacher will also decide on the volume of the complex exercise (whether the maintenance process includes the engine and the transmission or the entire motor vehicle). The resulting matrix system allows the student and the teacher to have an overview of the competencies that are already acquired and those that require further work. The complex exercise matrix system also creates an opportunity to work using sample exercises, as it is impossible to cover all possible motor vehicle malfunctions, deviations from normal functional performance, and changing maintenance requirements in the learning process, as technology advances rapidly and there are very large amounts of motor vehicle assemblies and details. 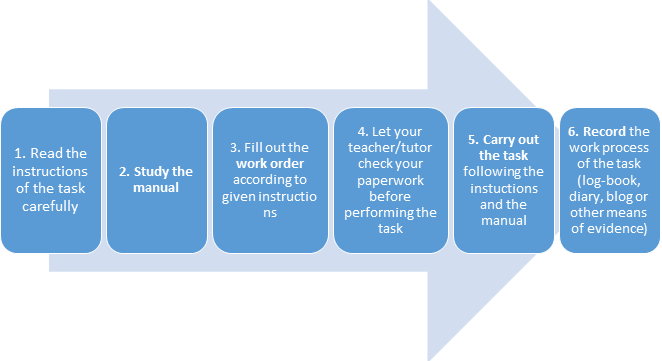 The teacher will pick a suitable exercise to achieve learning outcomes or make adaptions to the exercise by using an example based on the motor vehicle currently in work. When adapted exercises are entered into the exercise database, the complex exercise as a whole will develop. Passing competencies are assessed alongside professional and key competencies (The matrix table of learning outcomes and assessment criteria). There are several ways for recording your work. It depends on the systems and digital platforms used in your school, the agreements with your teacher or tutor etc. You can use www.weebly.com, www.wordpress.com etc which are free sites for creating your own website, blog or store.